To melt? Or not to melt? I prefer to use cocoa powder in baked goods instead of squares of unsweetened chocolate. Not only does using cocoa minimize cooking cleanup time, it's easier and faster to use. And there is no reason to think that substituting cocoa for baking chocolate sacrifices quality or flavor. Using good quality cocoa is always important, whether you rely on the old standby, Hershey's, or go for pricier varieties like Ghirardelli. Have you ever read about or experienced the pitfalls that can occur when melting chocolate? It may not melt evenly, so you could end up with scorched edges before the middle softens. If you chop the chocolate in a food processor before melting, problems can arise if the bowl isn't completely dry, or if the heat from the machine itself melts the chocolate before it even gets close to a double boiler. Semisweet and bittersweet chocolate have to be carefully watched and stirred frequently during the melting process. Chocolate in its solid form holds its shape even when the center is melted. If you wait too long to stir, the chocolate will scorch and be bitter. 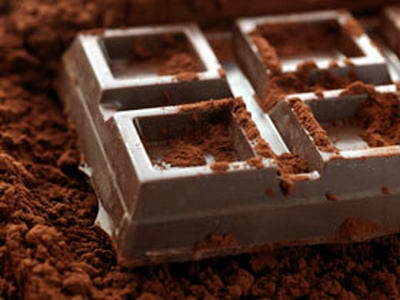 If even a tiny amount of water gets into the chocolate, it will "seize" (stiffen and clump up). Then, you're in trouble. Melting chocolate isn't impossible. I'm sure many of you are able to do it with little or no problem. I like to follow the KISS method (Keep It Simple, Stupid). Plus, by using cocoa, I usually avoid other potential disasters like inadvertently scrambling eggs when adding melted chocolate that hasn't cooled long enough. Here's how I do it. Whenever possible, I substitute cocoa for the chocolate. For each ounce of unsweetened chocolate called for in a recipe, use 3 tablespoons unsweetened cocoa plus 1 tablespoon of shortening or oil (I prefer oil; no melting necessary) mixed together. If substituting for semisweet chocolate, use the same amounts and add 1 tablespoon sugar. This works best in a recipe that calls for chocolate that is melted and cooled. Just think of all the time and pan-washing you'll save! Experiment with these recipes. I've included the directions for melting the chocolate in a double boiler for those of you who want to stick with that method. Instructions for using cocoa are in parentheses. We all know that everything is bigger in Texas, including soft, yummy cookies. These are great for making ice cream sandwiches. Just place some of your favorite ice cream on the bottom of one cookie and top with another. Position the rack in the center of the oven. Preheat the oven to 350°F. Line a large baking sheet with parchment paper. Set aside. Whisk the flour, baking soda, and salt in a medium bowl until combined. Set aside. Beat the butter and shortening in a large bowl, using an electric mixer at medium speed, until softened and smooth (about 1 minute). Add the sugar and brown sugar and continue beating at medium speed until pale brown and thick, but still somewhat grainy (about 2 more minutes). Beat in the egg and vanilla, then pour in the chocolate (or cocoa mixture) all at once and beat until smooth (about 1 minute at medium speed). Using a wooden spoon or a rubber spatula, stir in half of the flour mixture just until you don't see any white streaks in the batter. Stir in the milk until moderately smooth. Stir in the remainder of the flour just until uniform. There may still be small lumps in the soft, wet batter. Drop by heaping tablespoonfuls onto the prepared baking sheet, spacing the mounds 2 inches apart. Bake for about 15 minutes, rotating the sheet once during baking. When done, the cookies will have rounded, bumpy-looking tops. Remove the baking sheet from the oven and press the cookies lightly with a heat-safe spatula or a large serving spoon, flattening them slightly to create smoother, rounded tops. Cool for 5 minutes on the baking sheet, then transfer to a wire rack to cool completely. Cool the baking sheet for 5 minutes before baking additional batches. Makes about 20 large cookies. Bread pudding is an all-time favorite just as it is. But why not improve it by adding chocolate? Even better! Grease an 8-inch square baking dish. Scatter 1/3 of the bread pieces in the dish in an even layer. Sprinkle with 1 tablespoon sugar and drizzle with 2 tablespoons melted chocolate (or 2 tablespoons of cocoa mixture). Repeat layers. Top with remaining bread pieces. In a 2-quart saucepan, heat milk to simmering over medium-high heat. In a medium bowl, combine eggs and 1/3 cup sugar with a wire whisk. While whisking constantly, slowly pour simmering milk into the egg mixture. Stir in remaining melted chocolate (or cocoa mixture) and vanilla. Pour the egg mixture over the bread. Refrigerate until the bread has absorbed the chocolate mixture, gently stirring occasionally. Refrigerate for about 3 hours. Preheat oven to 325°F. Sprinkle pudding with the remaining 1 tablespoon sugar. Make a water bath by placing the baking dish within a medium roasting pan. Place them in the oven, and carefully pour enough boiling water into the roasting pan to come halfway up the side of the baking dish. Bake until a knife inserted in center of the pudding comes out clean (about 50 minutes). Remove the baking dish from the roasting pan. Place on a wire rack to cool for 15 minutes. Serve pudding warm, or cover and refrigerate to serve cold later. Makes 8 servings. I haven't forgotten all you cheesecake fans. This one's for you. Blending in the chocolate creates a pretty, marbled appearance. Don't overmix, though! Preheat oven to 325°F. Lightly grease bottom and sides of a 9-inch springform pan. Sprinkle graham cracker crumbs over bottom and sides of pan. In a large bowl, beat the cream cheese at medium speed until smooth and creamy. Gradually add the sugar, beating until smooth. At low speed, add the eggs one at a time, beating just until blended. Add the orange juice and grated peel. Beat 2 minutes at medium speed, scraping sides of bowl occasionally. In a small bowl, reserve 1-1/2 cups of batter. Pour remaining batter into the crumb-lined pan. Slowly blend melted chocolate (or cocoa mixture) into the reserved batter. Drop spoonfuls of chocolate batter onto the batter in the pan. Using a table knife, swirl chocolate batter through the light batter to create a marbleized effect. Bake for 1 hour or until set. Cool for 10 minutes, then remove sides of pan. Refrigerate several hours or overnight. Store in refrigerator. Makes 16 servings.